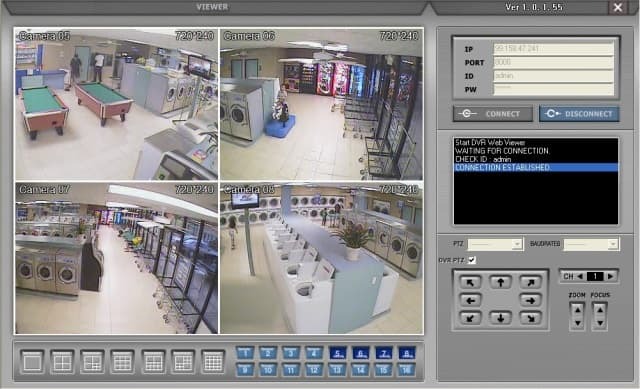 The following laundromat surveillance system images were taken remotely over the Internet from Florida while helping a customer in Houston Texas setup the remote dvr viewer application to view his cameras over the Internet. This customer can now watch his business when he is not there. CCTV Camera Pros typically gets permission from customers while providing support to login remotely to their security camera systems and capture screen shots so that we can show other customers the different situation that our surveillance equipment is used for. We sincerely thank the Amy and Yang in Texas for letting us capture these images while logged into their CCTV surveillance system. The images show the DVR viewer software that comes with the 8 surveillance DVR. For these screen shots the viewer application was used. This software allows you to view your security cameras remotely over the Internet using a Windows PC and a high speed Internet connection. This model DVR is our best seller and is available in 4, 8, and 16 channel models. View this DVR series here: Surveillance DVRs. *Please Note: The actual images are even clearer directly on the system that what is seen on this web page. Surveillance images that are viewed on location are always much higher quality than taken remotely over the Internet because of bandwidth / connectivity limitations. Also these images have been screen captured and converted/compressed to Internet format which lowers their quality. The actual performance that you will experience with one of CCTV Camera Pros systems is even better than what you see here. We guarantee it! 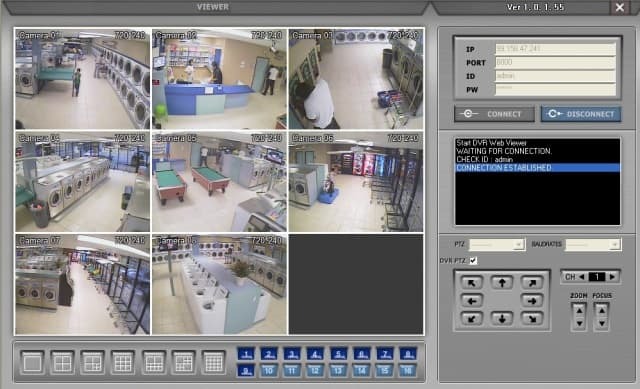 This DVR viewer software is also capable of controlling PTZ cameras remotely. You can also configure most settings on the DVR from a remote location. Thanks again to our great customer in Houston Texas for letting us take these screen shots while helping them get their system setup for Internet Access.